RENTON, Wash. (AP) — The conversation takes place throughout the week inside the Seattle Seahawks training facility. A group of four or five throwing out suggestions and discussing whether their idea can actually be executed. By the time Friday rolls around, a final decision has been made and the group spends part of the day seeing if they can pull off the plan successfully if the opportunity presents itself on game day. The talk isn’t about a play or scheme. Instead, it’s about what has become a must-see event anytime the Seahawks wide receivers find the end zone. Their touchdown celebrations have drawn attention around the NFL and set a standard they’re trying to top each week. The group of receivers — Baldwin, Moore, Jaron Brown and Tyler Lockett primarily — may not come close to leading the league in catches because of Seattle’s run-first offense. But when any of the four find the end zone, getting past the goal line is just the beginning. It started in London when the Seahawks beat Oakland and Brown caught a touchdown on Seattle’s opening drive. Brown at first briefly celebrated by himself before being joined by Baldwin, Lockett and Moore with an ode to “Drumline” and a fight scene from the movie that was released in 2002. Two weeks later after Lockett caught a TD in Detroit, it was an ode to baseball , the World Series and Nolan Ryan when Baldwin, the hitter, charged Lockett, the pitcher, and was knocked out in the process. Against the Chargers, it was “The Four Heartbeats ,” which was a tribute to the 1991 movie “The Five Heartbeats.” Each wide receiver showed off a bit of his dance moves and Brown — who caught the touchdown — ended up getting the “featured” role at the end of the routine. It’s the celebration most say was the best. “I don’t think it went as well as we wanted it to,” Baldwin said. 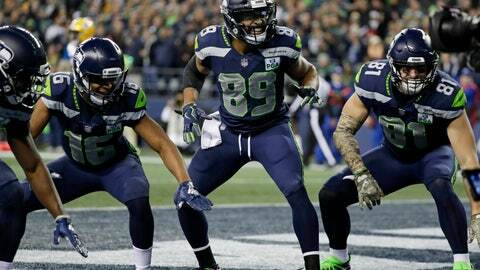 There was supposed to be one more celebration thrown into the recent mix, but as Baldwin said, “Tyler screwed it up.” After Lockett’s 23-yard touchdown reception against the Los Angeles Rams on Nov. 11, there was supposed to be another group performance. But before everyone could gather, Lockett handed the ball to boxer Floyd Mayweather Jr., who was in an end zone suite. That celebration was supposed to be specific to the Rams game and was not carried over to the following week. It’s another sign of how serious and how much fun this group is having. And no, it’s not taking away from their preparation for what’s important — the actual game — including this week’s matchup against Carolina that has major NFC playoff implications. “It’s minutes, but obviously you guys know when we focus in on something, we get focused in on something so it doesn’t take us too long to get it down,” Baldwin said.